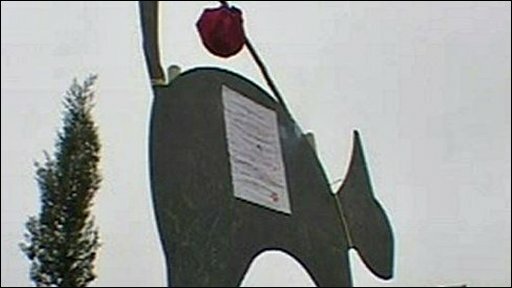 A cat sculpture which went missing from a Bedfordshire roundabout in 2007 has reappeared on a different roundabout with a note. The black cat was originally on the Black Cat Roundabout on the A421 junction with the A1. It went missing in June 2007 but has now appeared on the G&M Growers roundabout near Upper Caldecote. Attached to the cat is a note saying: "I was catnapped a long time ago by some nasty people." It continues: "Some nice people found me in a ditch and got me this far". The note is signed BC with a small paw print. So far it is not clear where it went or how it was returned.